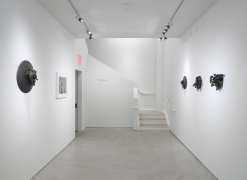 Alexander Gray Associates presented an exhibition of work by Melvin Edwards reflecting his engagement with and influence of Africa. Edwards’ first visits coincided with a key moment in the region’s history as recently independent countries defined their postcolonial national identities. Since his first trip in 1970 to Ghana, Togo, Dahomey (now the Republic of Benin), and Nigeria, Edwards has consistently traveled to Africa, often returning to Nigeria and Ghana and making repeated trips to Senegal and Zimbabwe. He eventually established a studio in Dakar, Senegal in 2000. 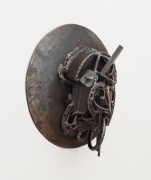 His experience of and engagement with this region and its traditional and contemporary art scene has nurtured Edwards’ investigations of metalwork and its formal qualities, abstraction, history, language, exchanges between cultures, and the significance of personal relationships. 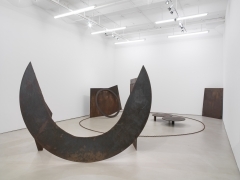 The central work in the exhibition was Homage to the Poet Leon Gontran Damas (1978–81), a monumental installation shown for the first time since Edwards’ retrospective at the Neuberger Museum of Art in Purchase, NY in 1993. 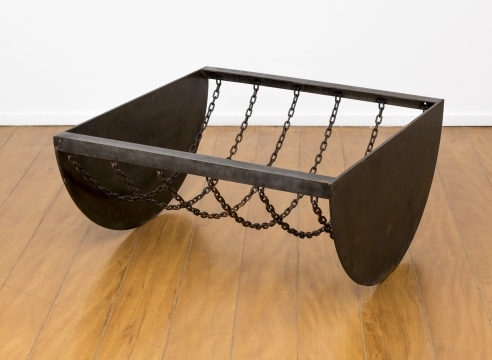 This work consists of several large-scale metal geometric sculptural elements and a long piece of chain organized in relation to each other to create an environment that encourages gathering and meditation; collective consciousness and contemplation. 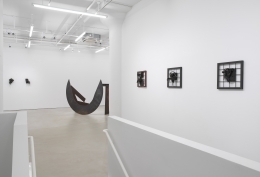 Grounded to the horizontal plain of the Gallery’s floor, the installation was oriented using the sun as a compass in order to face East, looking towards Africa. 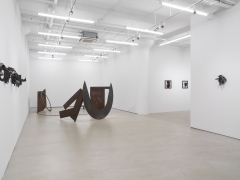 He conceived the work to honor Damas, a co-founder of Negritude, active in anti-colonial politics, and a poet whose style creatively eschewed the standardized French of the former colony and embraced influences from Harlem jazz to Caribbean calypso. 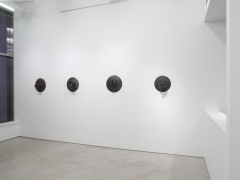 Edwards met Damas in 1969 through the poet, activist, and performance artist Jayne Cortez, Edwards’ late wife and artistic collaborator, with whom he traveled extensively throughout Africa and across the world. 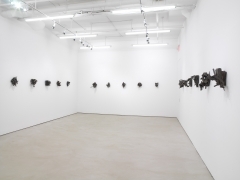 Melvin Edwards’ use of materials, primarily the result of his formal and aesthetic concerns, unfold multiple meanings as they relate to African and African Diasporan cultures and histories, represented in the exhibition in a selection of Lynch Fragments and wall-sculptures. 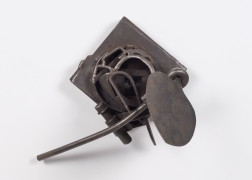 Returning from a trip to Nigeria in 1973, Edwards began incorporating machetes as a formal and symbolic element as in the disc Kasangadila: For Francisco Romão de Oliveira e Silva (2004), made in homage to his friend Francisco Romão, a prominent politician and key figure in the Angolan War of Independence (1961–74). 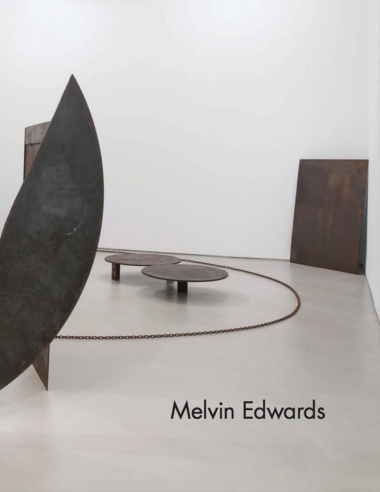 Edwards recognizes the utilitarian function of machetes in West Africa, describing them as “another shape of steel that already exists.” At the same time, these objects stand as embodiments of civil uprisings, which speak to Edwards’ life-long engagement with social movements. 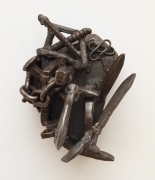 The Lynch Fragment Ginau Tabaski (2006), created entirely out of Senegalese objects, including the grid-like base sourced from local metal workshops, refers to the Islamic Senegalese holy day Tabaski. Edwards sees Tabaski, which involves feasting with family and friends, as “a day where human beings come to grips with mortality, and with the importance of sacrifice in order to accomplish a sense of fulfillment in life.” For Edwards, Ginau Tabaski is a summation of life, death, and looking towards the future. 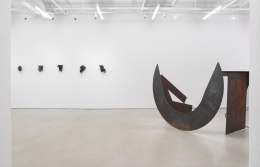 Edwards’ works also speak to a broad network of creative minds including African artists, writers, and craftsmen, with whom he has developed personal relationships throughout many decades. 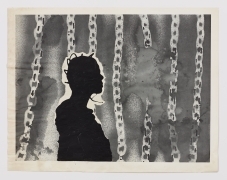 Edwards titled his Lynch Fragment Ibadan Oke (1992) in homage to his visits to Nigeria during the 1970s. The urban landscape of the Yoruba city of Ibadan stimulated Edwards’ interests in architecture and urban design, which were also greatly encouraged through his close friendship with Nigerian artist and architect Demas Nwoko. He met and worked with many others in the city, including the Nigerian Nobel Prize-winning playwright and poet Wole Soyinka, and the Jamaican writer Lindsay Barrett. The Fragment Djeri Djeff Papa Tall (2008) references the phrase “djeri djeff” or “thank you” in Wolof—a widely-spoken language in Senegal—as well as Papa Ibra Tall, a seminal Senegalese modern artist, founder of the influential tapestry workshop Manufactures sénegalaises de arts décoratifs (MSAD). Tall and Edwards met in Senegal in 1999, and later collaborated when Edwards produced two tapestries in MSAD.